As I struggle with toileting adventures in my own home on a regular basis, I am grateful that today’s guest, Lynn, is here to share her story about potty training and judgment. No little person, or their mama, ought be looked down upon for when or how they go to the bathroom. In December of 2010 I gave birth to my first son. I was lucky enough to go through the experience with 2 close friends (I’ll call them Friend A and B) who both had their daughters within 2 weeks of me. I found it fascinating to see how different we all were when it came to how we raised our babies. And I loved the fact that we were all able to discuss things and support each other. It was amazing. I felt empowered as a mom; I felt close to my friends. But then things started changing. When Alex hit about 18 months I bought a potty for him and set it up in the bathroom; but he wasn’t showing much interest in it. I didn’t worry too much about it. Everything I read and my Dr told me indicated that it can take until a child is three to potty train, and all kids are going to do it at their own pace. So I made the decision that I wasn’t going to push Alex into potty training before he was ready. Even though I found out when Alex was 21 months old that we were expecting baby number 3, I wasn’t going to push him. I would deal with having 3 babies in diapers. Friends A and B also bought their kids a potty around the same time. Except that unlike Alex, their kids took to it super fast. By 24 months, Friend A’s daughter was day trained and Friend B’s daughter was day and night trained. I still wasn’t pushing Alex to use the potty if he didn’t want to. One day, just before my third child was due, I was talking to talking to Friend B. She asked me how Alex was doing with potty training. I was honest and told her that I wasn’t pushing it right then, I was going to wait until after he adjusted to the new baby and then start encouraging him to use the potty since he was going to be 2.5 years old. I honestly thought by saying this, she would understand and support me the way she always had in the past. Instead she told me that by being lazy about potty training him I was enabling him to continue being lazy and doing him a disservice. I was shocked. I was hurt. I didn’t know how to reply to her. I thought maybe I was overreacting to her comments so I talked to Friend A about it. I told her about the conversation with friend B and how I didn’t understand her perspective. I hoped that Friend A would assure me that I was doing what was right for my family and not to worry about Friend B’s opinion. Instead, she told me that she agreed with Friend B and that if I was a ‘responsible, good mom’ I would have him potty trained already and I also wouldn’t have had three kids as close together as I did. Again I was shocked, hurt and unsure of how to reply. These conversations made me really question if I was doing the wrong thing by letting Alex set the pace with his potty training. Maybe I was wrong to not encourage him more? Maybe I was encouraging him to grow up to be lazy? After a lot of soul searching, and a conversation with another friend, I decided that those two ‘friends’ were wrong. I was doing what was right for me and my son. He wasn’t ready to potty train. Over the last few days Alex has been showing more signs of readiness. I think that now is the time to start encouraging him. Maybe in a week he will be fully potty trained. Maybe it’ll take us 6 months to get to that point. Either way, I am going to do what is right for him and me, and I am not going to care what other people think of that. Lynn is a 25 year old stay at home mom to three gorgeous babies…Alex, Nick, and Zoey. In her free time she enjoys blogging at http://lynncollins10.wordpress.com/. Completely understand! I’m pregnant with my second, and first is 22 months…random strangers kept giving me a hard time about not potty training him (why would I want to have two in diapers?!?) But my son isn’t showing any interest, so I’m not going to push him. Don’t worry about it. One of my friends was telling me that they had pushed their kid and he ended up with potty anxiety and was almost 4 before he would use it again (she also had 3 under 3, and everyone gave her a hard time too.) I don’t know why our culture feels the need to rush these things along…right now I would much rather change a diaper, than deal with an accident because my son doesn’t get it yet. I am so glad that you are listening to your son and not your friends. 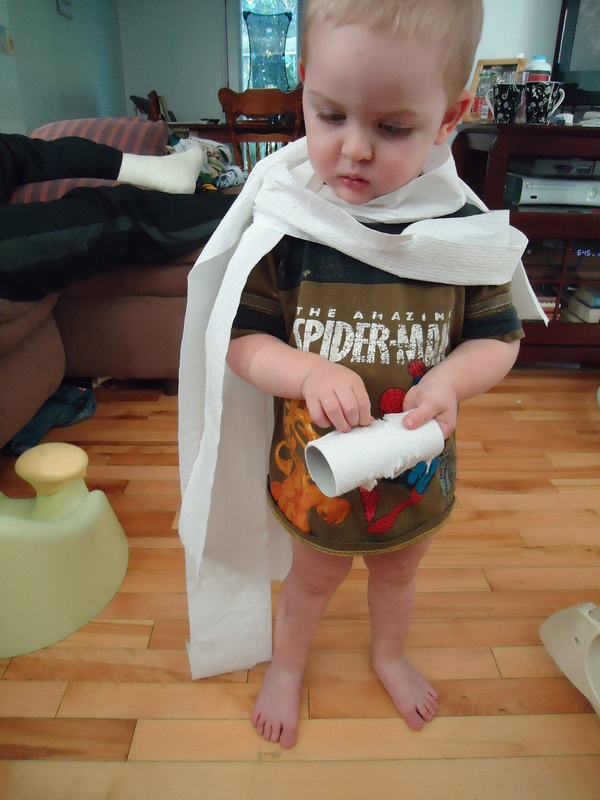 I would occasionally try and test my boys for readiness before three but potty training never took before that age. My youngest is a girl and theoretically they are supposed to be ready earlier but I am not even going to try until she is three unless she lets me know earlier. I hate cleaning up messes. All I would like to say is that I am sorry you dont have supportive and encouraging friends. Even if thats what they thought – your friendship and feelings would be to dear to me for me to say something so hurtful. I hope that You will find the friends you need and the love and support we all deserve. HUGS mama – you are doing a great job and I must be doing the same thing to my almost 3 year old as I have not pushed either. UNITED WE SHALL STAND! It is hard being a mom and knowing what is right. I have come to realize more now that people say things and sometimes do not realize that it might be taken as rude or hurtful because it was something pushed in their family. When it came to potty training my daughter, as you know started at 18 months. I was pushed by my mom saying that I should have already had my daughter trained as my brother and I were already trained by this age. Of course I felt defeated when I had a set back on our progress due to my daughter having the flu and even though my daughter was fully trained by 25 months I still hear from my mom how much later she was trained that everyone else. Sometimes, people try to give advice but it does not come out right. Glad to hear that he is showing interest lol its a whole new world when potty trained sometimes wishing that they were still in diapers.